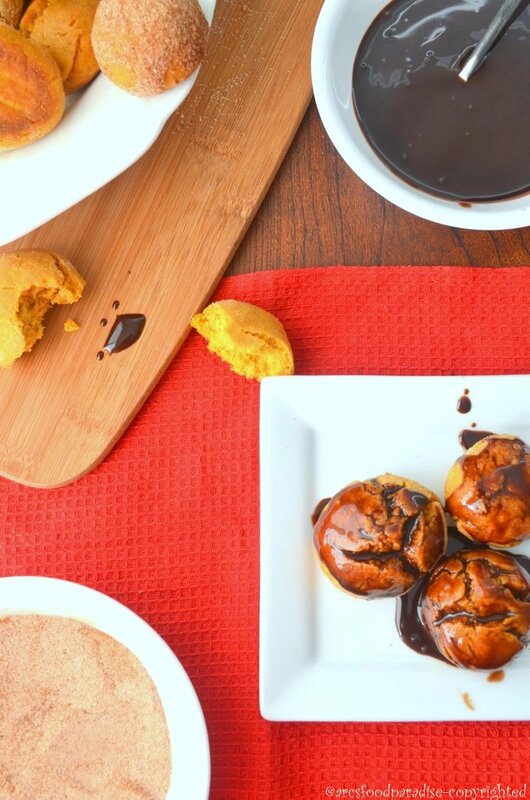 Pumpkin Doughnut Holes (Baked) with Cinnamon Sugar and Chocolate Glaze | The Flavor Nook! The lush tall trees in the backdrop of our living room are slowly showing it’s true colors. I see plenty of leaves already blanketing the shadows of the trees below. On our drives just outside the city, we had already seen these beautiful changes but I still hadn’t begun to accept that the time has come. Now, every morning when I open the blinds for the sun-light to brighten our day, I take a peek at the slowly withering trees and begin to realize that in a couple more weeks, all the leaves will turn beautifully yellow, brown and orange, and will begin to roll off the branches with the touch of the slightest breeze leaving the once lush green trees all alone and barren. So, yes…..FALL is here! The thing that actually cringes me is not the arrival of ‘Fall’, but rather that this reminds me that ‘Winter’ is not far away! Jackets, Mufflers, Shoes all over again! Whew! But, hey it’s the amazing cycle of nature, each season bestows upon us it’s own beauty and transform our surroundings in a magical way! So, all in all the blossoms of spring, the greenery of summer, the breath-taking colors of fall and the white snow blanket of winter – they are all awe-inspiring! With fall, comes the sights of pumpkins everywhere. All the stores are already decked up with Halloween stuff! 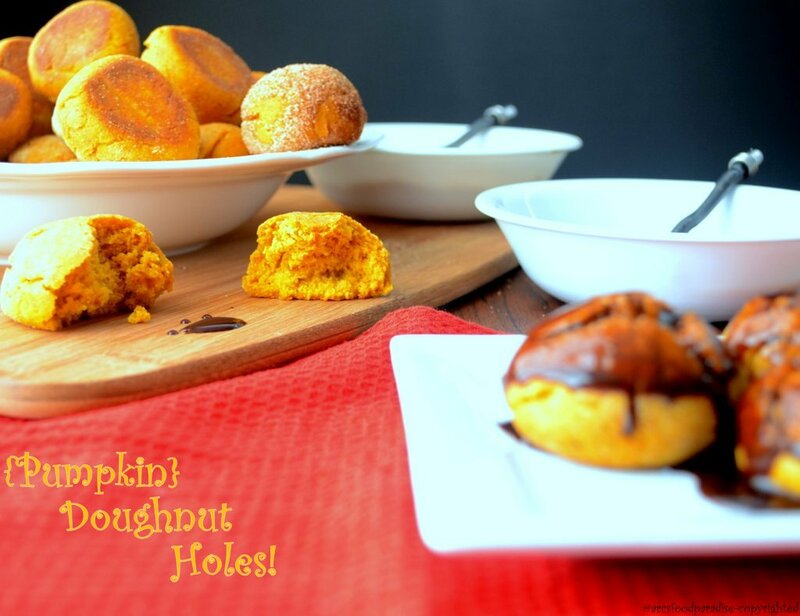 So, I decided to make these ‘Pumpkin Doughnut Holes’ because firstly, they scream ‘Fall’ and secondly because they are scrumptious and so fun to eat! These are just perfect to make, pack in small snack bags and give it to kids on Halloween apart from the regular candy! Kids would sure love them! So, I love deep-fried food but try to bake whenever I can so as to cut down on calories and make it kinda guilt-free. The good thing about this recipe is that I used whole-wheat flour, substituted part of sugar with honey and of course baked them. And why doughnut holes? Again, they are smaller in size than doughnuts….so good dessert/snack portion control! 1. Preheat oven to 350 deg F. Line a baking sheet with a lightly greased parchment paper. You could also use lined mini muffin pan for this. 2. In a bowl, take all the dry ingredients – whole wheat flour, cinnamon, nutmeg, sugar, baking powder, baking soda and salt. Mix well. 3. In another bowl lightly melt the butter. Beat eggs into it and whisk well for a couple of minutes. Now, add honey and vanilla extract and mix well. 4. Add the eggs mixture to the dry ingredients. Mix well. Add the pumpkin puree now. Mix well and set aside. 5. Using a teaspoon or a tablespoon (based on the size desired), scoop out the batter and arrange on the baking sheet. Put the baking sheet into the oven and bake for 15 to 16 mins or until a toothpick comes out clean. 6. Soon as they come out of the oven, lightly use some cooking-spray over all of the doughnut holes/doughnuts to keep them moist. – For the Cinnamon Sugar topping, simply take 1n1/2 tsp cinnamon and 4 or 5 Tbsps white sugar. When the doughnuts are still warm and after they are lightly coated with the cooking spray roll them in the cinnamon sugar so that the sugar sticks to it. – For the chocolate topping, you could use chocolate syrup or melt some semi-sweetened chocolate with a tsp of butter. 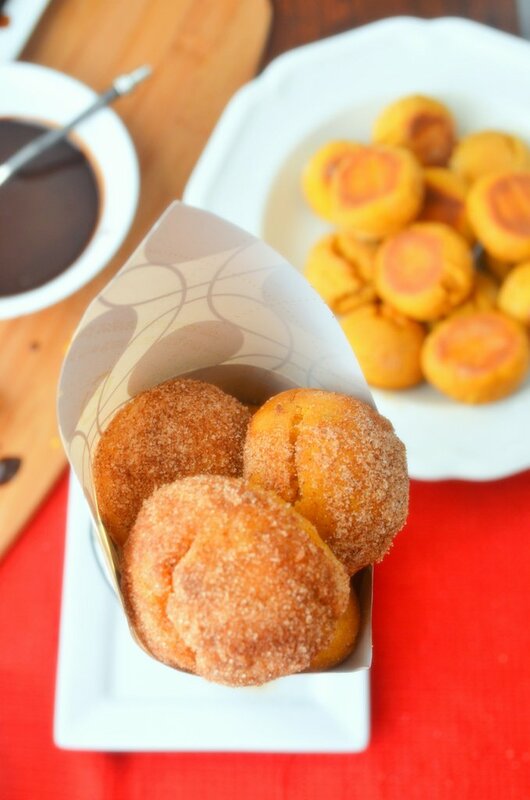 – Since, these are baked they may not exactly taste like the deep-fried ones but are delicious nevertheless. Also, I made the batter a little more wet when compared to the regular doughnut batter as baking tends to dry out the doughnuts a little. – I’ve also made regular sized doughnuts with this batter. Use a doughnut pan and add 3 to 4 mins more to the baking time. – You could certainly substitute honey with an additional Tbsp of sugar. 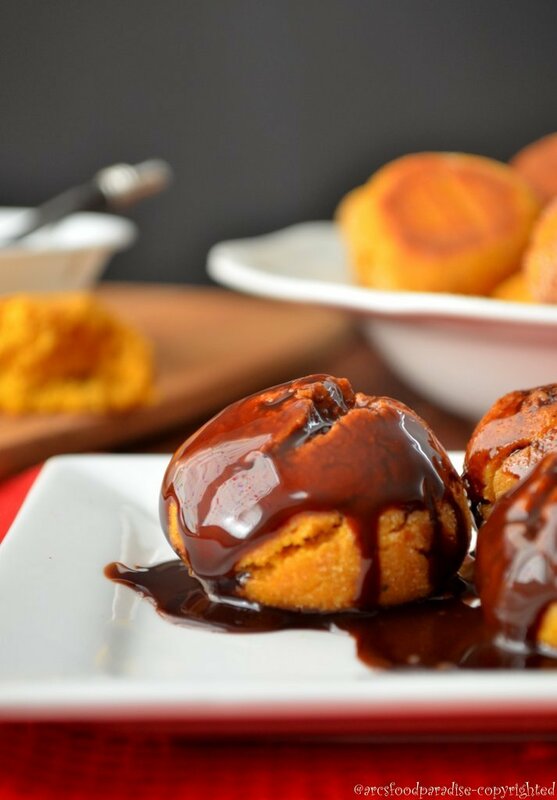 – Do the chocolate glaze only before serving else they’ll become soggy. Update: Sending this over to ‘Perfectly Pumpkin contest‘ at b-inspiredmama!